I don't even remember what day it is on the garage rehab....All I know is that I built the work tables all weekend and I'm burnt. As you can see from this preview, I've gotten the tables mostly built and moved into the corner. The rest of the garage is still disaster central. 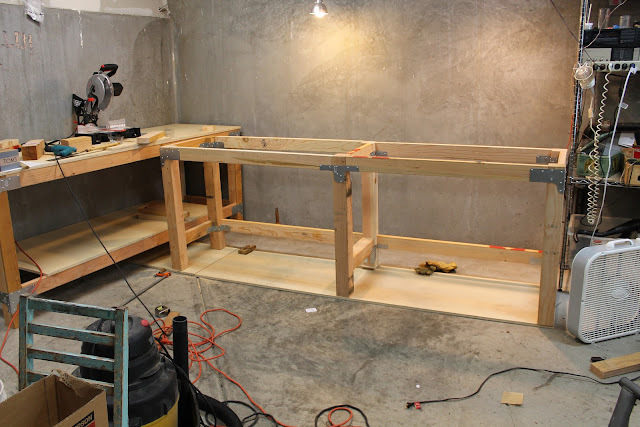 I will give a complete play-by-play on the worktable build as soon as I get it completely assembled and varnished. This project is going stultifyingly slow. Looking good ! Cant wait to see how functional and organize the garage turn out . Dont cut any of your fingers while doing so :) lol . PS: A other rainy day in the UK for us ! That is going to be a fantastic place to work! The projects that burn you out always seem to have the best results. Oh man, I certainly hope so (on both sentiments). I'm going to scream if we return to our usual disarray after all this.